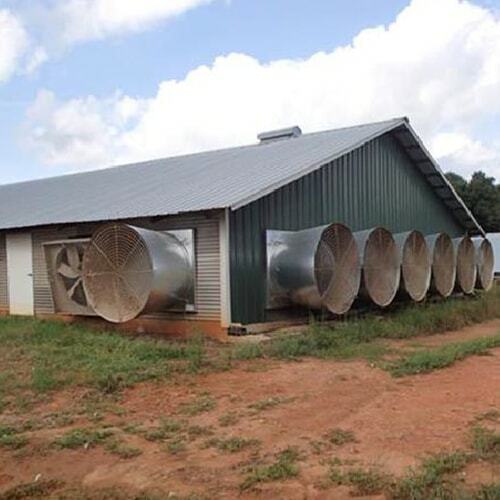 The typical poultry house controller makes decisions on ventilation/heating equipment operation based almost exclusively on house temperature. Yes, there are a few controllers that may make adjustments to minimum ventilation rates based on house humidity levels, but when it comes to the operation of a house’s heating system, exhaust fans, ventilation mode (inlet vs. tunnel) and evaporative cooling pads, decisions are typically based solely on house air temperature. 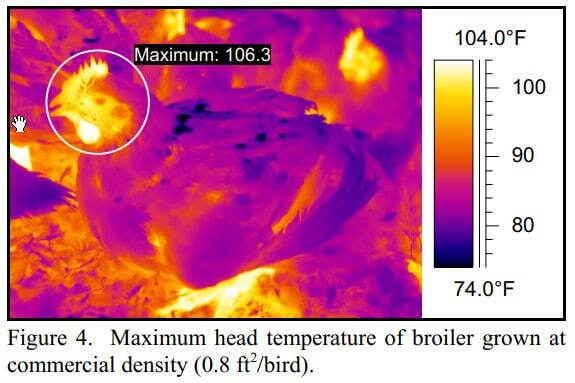 Though for the most part this works fairly well, the fact is, a bird’s thermal comfort (whether a bird feels hot or cold) is determined by much more than just air temperature. For instance, as humidity increases a bird will lose less heat through respiration and will therefore feel warmer even though house temperature may have not changed. As air speed increases, heat removal from a bird increases and a bird will feel cooler, again, even though the actual house temperature may not have changed. Whether a house temperature of 75oF is excessive for a flock of market-age birds depends on the accompanying air speed and relative humidity. 75oF with no air movement and a humidity of 90% is likely to result in heat-stressed birds. Conversely, 75oF with an air speed of 700 ft/min and a humidity of 20% could possibly result in birds feeling chilled. 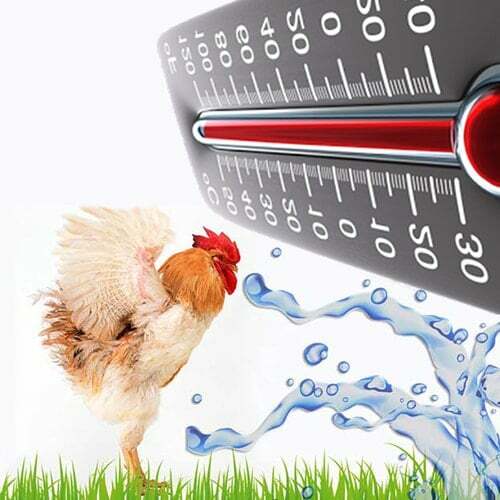 As a result, even though a poultry house environmental controller may be doing a great job at maintaining a programmed target temperature, it may not be doing as good of a job of controlling bird comfort if house relative humidity and air velocity are not taken into account when it is programmed. 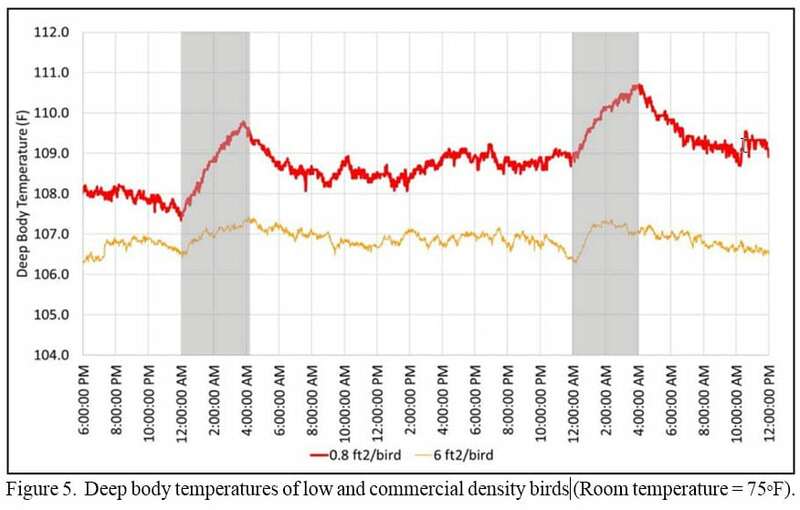 Though most producers realize that humidity and air speed can affect a bird’s thermal comfort, one factor that’s impact is often underestimated is bird density. The fact is that bird density can have more of an effect on bird comfort than either relative humidity or air speed. 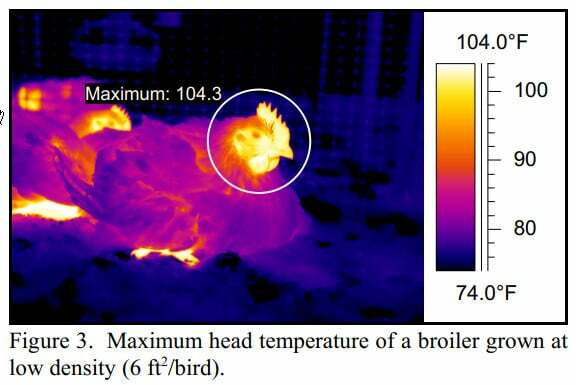 Figure 5 illustrates the average deep body temperature of two groups of seven-week-old broilers in a 75oF room being grown at two different densities, 6 ft2/bird and 0.8 ft2/bird. The relative humidity in the room was 75% and there were no circulation fans used during the two-day study. Though room temperature, relative humidity and the amount of air movement were the same for both groups of birds, average body temperatures were very different. The average body temperature of the birds in the low-density pen was in the normal range, 106oF - 107oF, while for the birds being grown at a more typical stocking density of 0.8 ft2/bird , that temperature was approximately two degrees higher. Two degrees may not seem like much, but it typically requires a 5 to 10oF increase in air temperature to result in a two-degree change in deep body temperature. 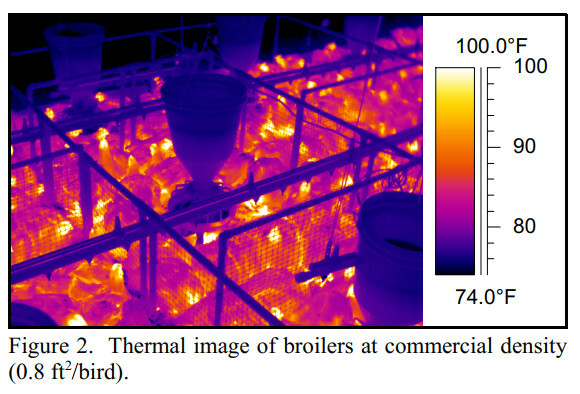 The thermal images taken of the birds in the two pens (Figures 1, 2, 3, and 4) confirm the birds were warmer in the commercial density pen even though environmental conditions were identical. The feather temperatures of the birds as well as the litter temperature around the birds were much higher in the commercial-density pen than in the low-density pen. Furthermore, head temperatures, which research has shown tend to follow deep body temperatures, were two degrees higher for birds in the commercial-density pen. The higher body temperatures in the commercial-density pens are primarily the result of the simple fact that there is less air movement around a bird when it is in close proximity to others. It is important to realize that even during cold weather there is air movement around a bird due to inlet system operation and naturally occurring convective currents due to warm air rising off the birds. Though the level of movement between the birds may be slight when compared to those seen in a tunnel- ventilated house during hot weather, it will still result in a significant amount of heat being pulled from the birds, making them feel cooler. But, as density increases, air movement around each bird will naturally decrease, which will tend to result in reduced heat removal and elevated body temperatures. 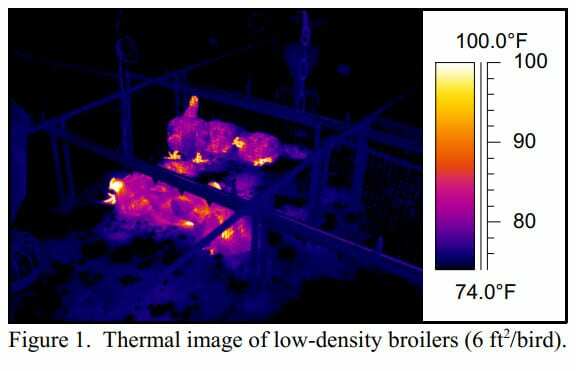 Density appears to have the greatest effect on deep body temperatures at night when the lights go off and the birds sit down. In this particular study, the dark period ran from 12 am to 4 am. 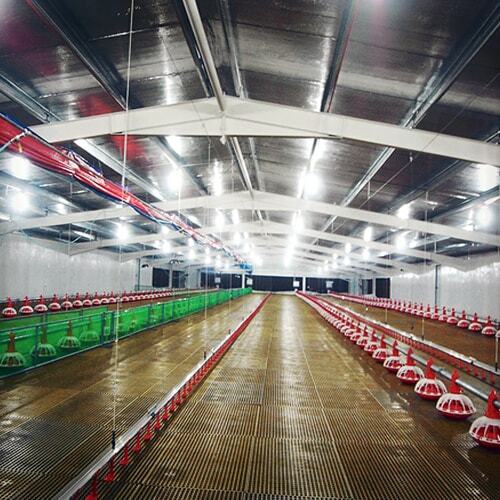 For the birds in the low-density pens, average body temperatures increased approximately one degree. For the birds in the commercial-density pen, average body temperature increased roughly twice as much, resulting in differences as much as three to four degrees between the two pens. The increase in body temperatures when the lights go off is the direct result of an overall decrease in heat loss from a seated bird. When a bird sits down, the percentage of its surface area that air can move over is significantly reduced. Since for a bird grown at commercial densities air movement over the sides of the birds is already limited due to the close proximity of other birds, the loss of heat from the underside of the bird is even more detrimental to the bird. The longer the bird sits, the more the body temperature will rise. Since the primary time birds sit down for a long period is at night when the lights go off, this is when the biggest effect of density on body temperature will be observed. This doesn’t mean that you have to grow birds at 6 ft2/bird to ensure they are comfortable. Just like air velocity and relatively humidity, bird density needs to be taken into account when managing the house environmental control system, especially during warm weather. As floor space becomes limited towards the end of the flock and air movement around each bird is naturally reduced, the difference between actual air temperature, as indicated by temperaturesensors,andeffectivetemperature (what a bird perceives the temperature to be) increases. As a result, it is important to consider density when determining target temperatures towards the end of a flock. 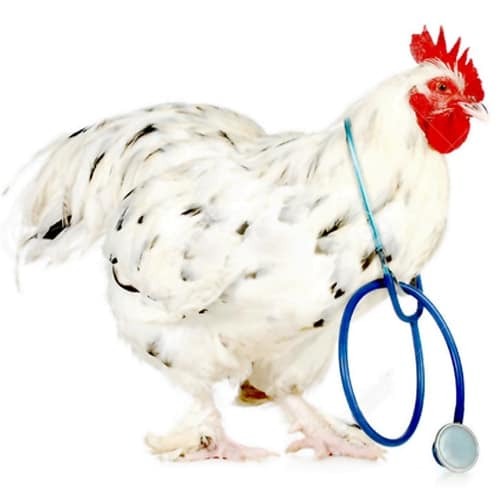 For instance, whether a bird is grown at a relatively high or low density doesn’t have much of an effect on bird body temperature for most of a flock. Whether you are growing a 4 lb. bird at 0.7 ft2/bird or a 8 lb. bird at 1 ft2/bird, target temperatures could be the same for first three or four weeks of the flock because in either case there would be a fair amount of space between the birds and therefore density would have little effect on effective temperature (Table 1). But, for instance, during the fifth and possibly fourth week of a 4 lb. bird flock there would be much less space between the birds when compared to a 8 lb. flock so that if the same house temperatures were maintained, the 4 lb. birds would feel warmer. 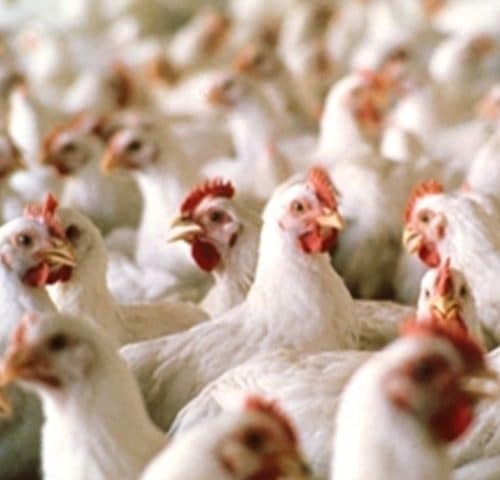 To offset the effect the limited space between market age birds has on effective temperatures, target temperatures need to be decreased the last week or two of a flock, regardless of age of the birds being grown. Precisely how much target temperatures should be decreased towards the end of the flock to offset the effects that density has on effective temperature is difficult to determine at this time. Research is currently being conducted at The University of Georgia to hopefully provide guidance on this subject, but in the meantime producers should keep in mind that the more the space between the birds becomes limited the bigger the difference there will be between what the sensors indicate the house air temperature to be and what the birds perceive the house air temperature to be.